Julie Dowling’s new exhibition Eegarra Beearaba (To Arise from Sorrow) is an exhibition of powerful singular portraits and celebratory icons centering on the meaning of the National apology to the stolen generations. 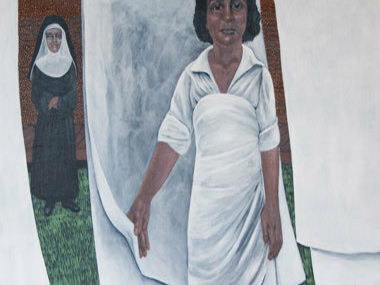 It is also a comment on what the apology meant to her own family and her community both in Perth and her traditional country in the Central West of Western Australia One of the portraits depicts Julie’s grandmother Mary Dowling who was taken away from her mother and placed in an orphanage where she was trained as a washer woman. She is shown hanging out bed sheets, with a nun supervising her. An intelligent woman who would have loved to fulfill her own dreams but was not allowed to because of the colour of her skin. Julie is from the Badimaya people but was raised in Noongar country in Perth. She has had a long and successful career as a painter commenting on the history of her people and the realities of the stolen generations making the viewing public aware of their plight. In 2006, Dowling was awarded an honorary doctorate from Murdoch University. Last year she had a survey show at the Ian Potter Museum of Art in Melbourne entitled Strange Fruit: Testimony and Memory in Julie Dowling’s Portraits curated by Jeanette Hoorn. Her work is currently touring in the first National Indigenous Art Triennial, Culture Warriors. A Multi Media installation, Oottheroongoo (Your Country) supported by an Australia Council Fellowship is currently showing at the Perth Institute of Contemporary Arts. Eegarra Beearaba (To Arise from Sorrow) will open at the Brigitte Braun Gallery, 4 White Street, Windsor on Saturday 12 July from 2-4pm and runs until 8 August 2008. Gallery hours are Wednesday – Saturday 1-4 pm and by appointment. The artist will be present at the opening and available for interviews by arrangement. For more information please call Brigitte Braun on 03 95212324. The exhibition can be seen on www.artplace.com.au from 7 July. High resolution images are available on request.